Have a fun time enjoying life at the countryside and make a living out of growing and harvesting plants. 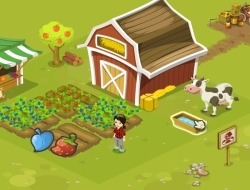 Create your own farmer and make sure he reflects your personality. Once you have done that, prepare your soil and then plant the seeds you have just bought from the market. Spend your money well as they are limited, until you can sell your freshly cut vegetables, fruit or flowers. Once you have enough money you can buy dogs and other animals. Your schedule will be full, as you need to constantly water your plants, feed and groom the animals, but with a bit of hard work you can make loads of money. Goodgame Farmfever 6.00 between 0 and 10 based on 2 votes.